ATLANTA – With a midnight-on-Black-Friday-level of haste, swarms of media members rushed into Kentucky’s locker room inside Phillips Arena as soon as the doors opened Wednesday. That's where the Wildcats made their home for the South Regional media day prior to the Sweet 16 match-ups. Freshmen Hamidou Diallo, Shai Gilgeous-Alexander and Kevin Knox – three of the team’s top four scorers – were escorted to another room to field questions at the dais, but this of course being Kentucky, there was still enough star power left in the locker room to draw the bright lights of local news cameras. Sandwiched between freshmen Quade Green and Nick Richards was redshirt junior guard Dillon Pulliam, a 22-year-old walk-on who probably could’ve drawn a charge on at least one of the media members who were crowding his space to get a better angle to interview one of his teammates. Pulliam is the oldest player on the nation’s youngest team. Kentucky ranks 351st out of 351 teams in terms of experience, according to KenPom.com, which calculates the team’s weighted average – based on minutes played by each player this season – to be 0.18 years. The Wildcats have eight freshmen on their roster. Pulliam is a former high school valedictorian-turned-computer engineering major, a scout team player on the basketball court, a team chauffeur to local fast food restaurants when called upon, a member of the SEC Community Service Team, and a lifelong Kentucky fan. His college career began at Division III Transylvania University, where the 6-3 guard averaged 4.8 points and 3.4 rebounds per game as a freshman. 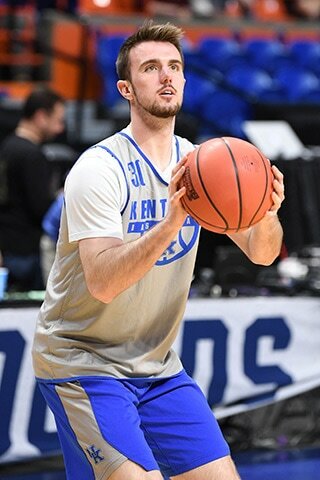 When Kentucky graduated three senior walk-ons in 2015, the team needed players and the opportunity arose for Pulliam to transfer and play collegiately for the Wildcats. "I’ve been around watching the team since I was this tall,” he said, holding his hand a few feet off the ground. As a kid, he’d watch Kentucky games at home in Cynthiana, Ky., just 40 minutes north of Lexington. When there were timeouts, he’d run to another room and shoot on a miniature hoop. Occasionally he’d get to watch his favorite team in person from the nosebleeds of Rupp Arena. To get to the #Sweet16, we had to grow from the adversity and lessons we faced earlier this season. Inside the Madness dives deep into that the last couple of episodes. Two new episodes drop tomorrow and Saturday on Facebook Watch. His favorite Wildcats of all-time are Tayshaun Prince and Gerald Fitch. His favorite Kentucky team? Coach John Calipari’s first at the school, which featured eight future NBA draft picks, headlined by John Wall and DeMarcus Cousins. Now Pulliam is wearing Wildcat blue and he occasionally shuttles around this generation’s versions of Wall and Cousins in his Nissan Maxima when the players go out to eat to Sonic, Cane’s or Zaxsby’s. “A lot of them can’t drive so sometimes I’m the one that’s driving when we go out to eat or anything like that,” he said. Their most impressive feat? Fitting the 6-11 Richards, 6-9 Jarred Vanderbilt and 6-7 PJ Washington in the back seat with 6-6 Shai Gilgeous-Alexander riding shotgun. Since Calipari arrived in Lexington, 31 Wildcats have been drafted, so it won’t be a surprise when some undetermined number of Kentucky players declare for the draft this spring and hear their names called on draft night. They’ll move on and Pulliam will finish up his college career helping the next wave of Wildcats figure out where their classrooms are in the fall or transporting them to satisfy their fast food fix. He’ll turn on the TV to watch the NBA and see his former teammates on the sport’s biggest stage. He’ll stay in close touch with some, like he does with Sacramento Kings forward Skal Labissiere, who was a freshman during Pulliam’s redshirt season. "Other stuff" extends far beyond what you might expect of a typical DI basketball student-athlete. He's already worked on a sound recognition device that can analyze what string is played on a guitar, as well as an artificial neural network. Pulliam has played just 11 minutes in his Kentucky career. He’s only attempted one shot in a Wildcat uniform, and he missed.